Working as part of an international group of toxicologists, scientists of the Far Eastern Federal University (FEFU) have found that harmful nanoparticles are formed in the process of arc welding using the most common types of electrodes today. Suspended in welding fumes, these particles infiltrate the respiratory tract. The study is published in Scientific Reports. The researchers found that regardless of the types of electrodes used, oxide particles of iron, manganese, silicon and chromium are carried by welding fumes. These particles could vary in a shape and their average diameter is 5 nanometers, placing them in the group of harmful nanoparticles. The smallest and consequently the most harmful nanoparticles form air suspensions in the human respiratory zone. "The chemical compounds formed in the process of arc welding and infiltrating the human body through the respiratory system are toxic because they contain metal oxidation products. Particularly dangerous are welding particles approaching the size of one nanometer. From previous studies, we know that such nanoparticles are able to translocate even into the central nervous system (CNS)," said Kirill Golokhvast, vice president for research of the Far Eastern Federal University (FEFU), professor of Russian Academy of Sciences (RAS), MD, Ph.D., ERT. During the welding, about 3 percent of the electrode and a small part of the material being welded are vaporized. 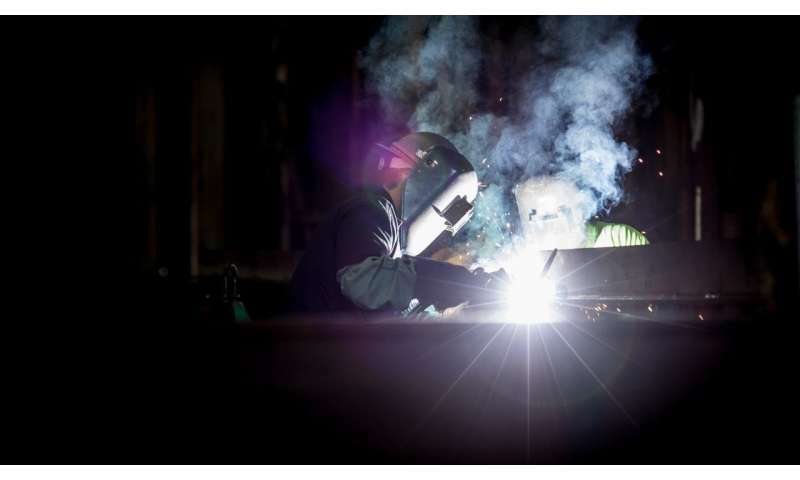 Welding fumes arise, containing micro- and nanoparticles of metal oxides. Such particles form air suspensions, which can be evenly distributed throughout the working space. Moreover, such welding suspensions can easily move far beyond the working area along with the air flow. The scientists believe that this mechanism should be taken into account when safety regulations are developed to protect the health of workers. At the same time, the modernization of safety measures will not be possible without detailed information on the formation of harmful welding nanoparticles, their shape, and the elements contained in their composition. Equally, scientists are interested in the mechanisms of distribution of such particles throughout working spaces and beyond. Today, there is no common point of view on how the parameters of welding affect the volume of welding fumes and, accordingly, the level of emission of harmful nanoparticles. Some authors suggest that an increased current strength reduces vaporization during welding. Others point out that the strength of the current is always proportional to the melting point of the metals being welded, which in turn increases the volume of vapor formation. The scientists hope that the results of their future research will help minimize the risks to the health of people in the industrial areas where welding is carried out.